Lunch is delicious buffet style gastro service serving a wide variety of Hot dishes alongside a healthy selection of cold salads and accompaniments. We serve a great selection of organic fine wines, ciders and artisan sodas. We also have a wide range of craft beers including a number of seasonal specials and limited editions from some of the UK's finest brew houses. Step 3: Pay at the Till and Enjoy! Pleasant food and the service was very good ; the only blight on what would otherwise have been a pleasant meal was organising parking, and the fact that two of our guests ended up with parking tickets, having misread a sign re. Sunday parking. We understand that Stem and Glory is soon to move to a venue which is more accessible. 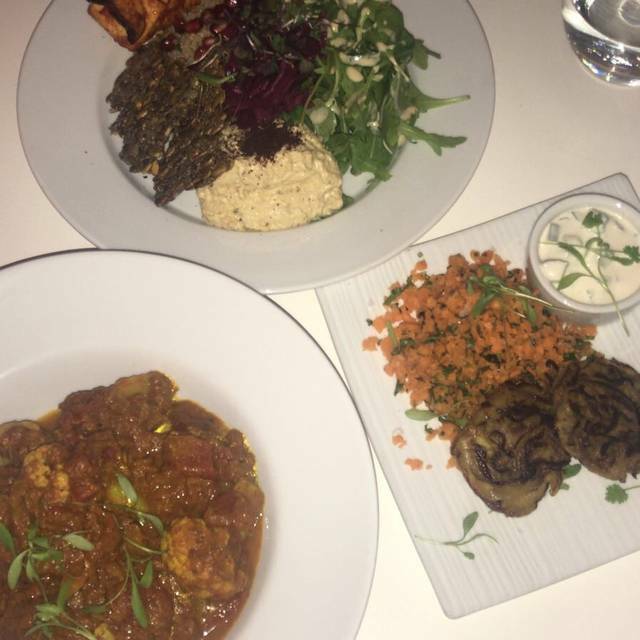 Amazing vegan food! We ate the lasagna and a special dish - pasta with mushrooms and white sauce and thought it was delicious! 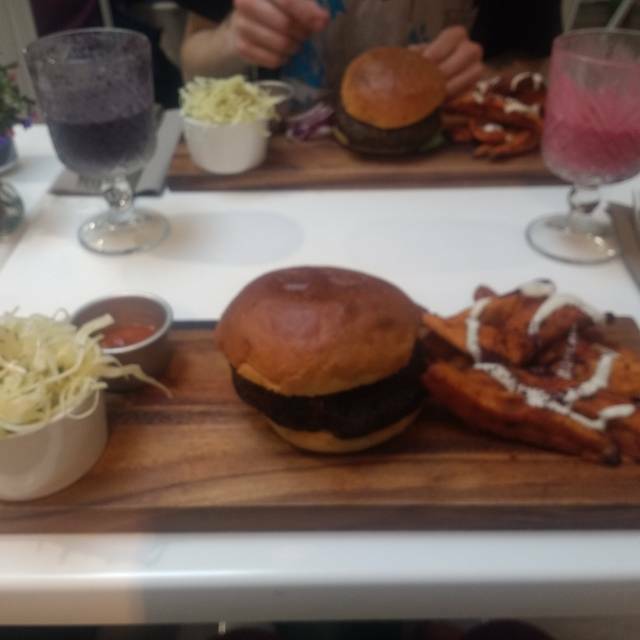 Was taken by a vegan friend (I'm not a vegan) and was very impressed by this place and will definitely be returning. The food is amazing and comes far cheaper than it should be (it is truly delightful). The menu was explained carefully and I was even helped with my milk selection for my coffee (me not knowing the difference between the multiple options of vegan milks). The only downside is that it is very hot in the restaurant, even tho it was cold outside. My friend said this was due to there being a hot yoga studio as part of the place. Overall, Excellent place and I highly recommend. Stellar vegan food. Most of the party ordered off the Christmas menu and were delighted with their food. Really excellent food -it’s a cliche I know, but I think that even the most ardent meat eater would be satisfied here. The menu was limited, but creative and delightful. It is well worth a visit. The food was excellent. We all went for the vegan lasagne and it was the first time I'd tried cashew bechamel. Delicious, and I'll be trying to make it at home. Thai coconut ramen, just delicious!! Beautifully prepared food and amazing flavours. The decor, ambience & service all faultless. The food was absolutely Great 👍 . Nice selection of alcoholic & non alcoholic drinks. The restaurant is nice and cozy with dim lights and nice music. We were served promptly and the food was simply amazing, I had the lasagne and my wife the Yogi bowl and then we had the cheesecake and the truffled Marquise and everything was absolutely outstanding. I will definitely come back when I am in Cambridge! Daughter took me here for a birthday treat after a days shopping in Cambridge. I'm a veggie, she a vegan. The food was lovely, tasty-would have liked more! Very quiet but we were the first in on a weekday. Staff very friendly. We are not vegans but had heard good things so thought we would give it a try. The food was pleasant enough without being outstanding, the wine was awful. There was little ambience in the space which was not very full for a Friday evening and the white tiled decor was rather clinical. 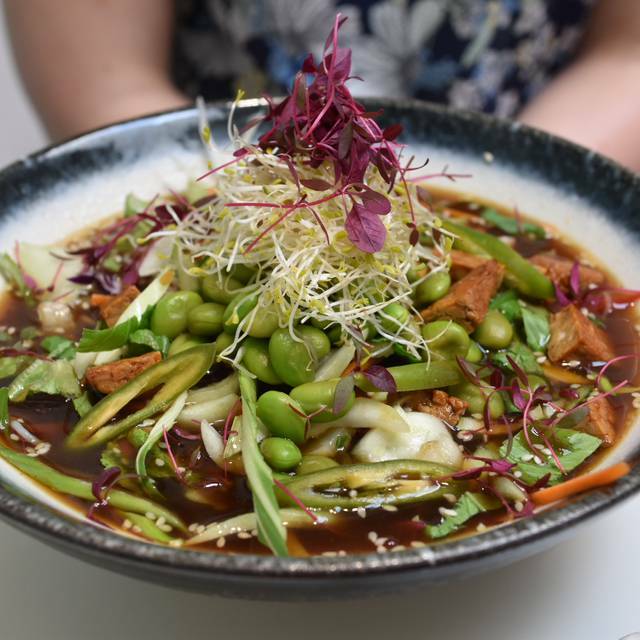 I would recommend it to anyone looking for a vegan meal as there are probably no better options in Cambridge. Amazing and delicious food. 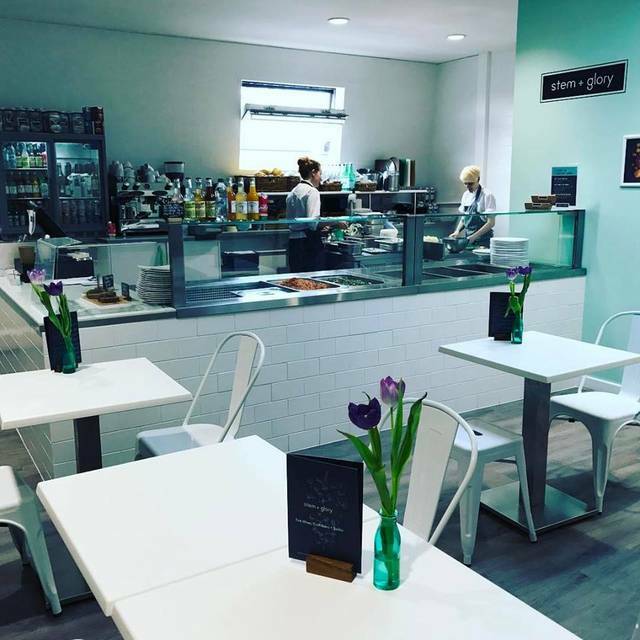 Really good to see a variety of choice including gluten free vegan options (most of the menu!). We both had celeriac lasagne, it was okay although quite solid to cut through. The cheesecake was amazing and the plum sponge was a little on the dry side. Staff were friendly and also helpful regarding my intolerance to bell peppers, the chef made a delicious cashew and lime dressing for the salad. My daughter is vegetarian, so I booked a table here for a Saturday lunch. The food was amazing. I don't often eat vegan myself, however I can whole heatedly recommend this restaurant. It's a bit of a funny place, like a cafe outside a yoga studio located above an Evans Cycles shop. Don't let that put you off, as all of our dishes were amazing. We will be eating here again, in future. We had a great dinner on Stem & Glory on a Friday evening. The food was very good and good value for money. Although a bit noisy, the ambient was warm and pleasant and the service very nice and helpfull. Only small downsite is that the pportions wre slightly small for our taste. Overall we highly reocmmend the place and the food. Read really good reviews on Stem + Glory but was very disappointed , I have no complaint about the place or service but the quality of food was a real let down . 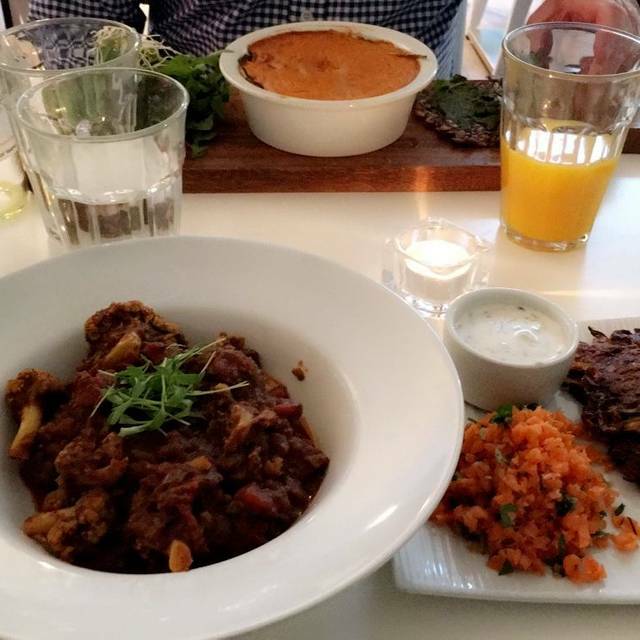 An excellent Vegan restaurant, with a small but very tasty menu. Open kitchen. quirky. Lovely food. The Lasagne is very good. The jackfruit burger is mildly spicy with the mustard and BBQ sauce. Great choice of drinks. 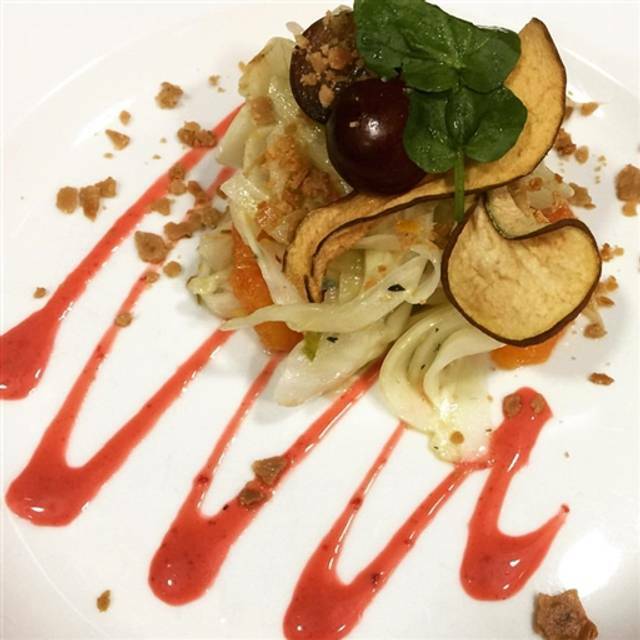 Vegan dishes with that special touch. Friendly and attentive staff. Excellent value. We’ve been recommending Stem and Glory to all our friends and will definitely be going back there. I enjoyed my meal (leafs and pickles, ramen, plum cake) so much that I woke up the next morning still smiling! Well done Stem + Glory! Excellent restaurant - Great food and service! I am looking forward to returning and trying the rest of the menu. I am not a vegan and was a bit sceptical. But experienced great food, very good wine, excelllent service! Would recommend this place to any food lover. I chose Stem+Glory to celebrate my birthday with a small group of friends. The atmosphere was very cheerful and friendly, the restaurant was nearly full even though it is hard to find compared to other restaurants in Cambridge. We probably spent 30 minutes choosing what to order, everything seemed amazing, and it surely was! Mango cheesecake was outstanding and so worth coming back for! Five stars for a friends get-together + it is VEGAN and DELICIOUS! I’d booked a table and although they had my booking, no table had been set for us so they cobbled together a few tables and chairs. Luckily it wasn’t full! Then the seating - tiniest metal stools or if you’re lucky a really uncomfortable metal chair! Not ideal for a relaxing evening. Food well presented and tasty but lots of dishes were really spicy including the vegan burger. Why would you make a burger really spicy? it's tough to spot this place from the street, but once inside very good food, tasty, fresh, well-presented, in a pleasant environment. Amazing food. Dragged some meat eaters here and they were super impressed. Great atmosphere as well ..
A friend and I went there dinner and very much enjoyed the healthy vibrant food. Service was also excellent. Loved the food...how do they make such a great creamy vegan sauce!! Fab tasty totally vegan food. Excellent quick service. I was looking for somewhere to take my vegan friend who was just in Cambridge for a few days. My first visit but hopefully not my last - lovely food, nice atmosphere, great service. We do like the food at Stem and Glory and what they've done for promoting high quality vegan food in Cambridge but the Chesterton venue is unsatisfactory as far as ambience and comfort goes - we were there with a group of 9 for a very special occasion and were sat at the table with benches and plastic stools - not all that comfortable - in fact if i remember there are no chairs with backs in the restaurant. The acoustic is boomy so it can be hard to hear and we asked for the music to be turned down twice. We were there until closing time and the kitchen staff had to be told to stop being noisy with the crockery. And then when i got home, i noticed that everything i was wearing right down to my underwear smelled of fat from the kitchens (almost like i had been at a chippy) - perhaps an extractor fan issue? i haven't noticed that on eating there in the past but it was most unpleasant. While most people enjoyed their dinners (the lasagna and yogi bowls), my husband had the main-sized butternut squash salad and, on reflection, we should have complained at the time as it was very small for £12 and did not contain all of the advertised elements. The deconstructed cheesecake could also be reconstructed again as there isn't much of it. The young male waiter is excellent and they were relaxed when i called to say we'd be late. As they expand, i think they really need to take into account their clientele's comfort and overall dining experience not just the quality of their food. Could they not actually move to a better, more accessible venue now that they're so successful? 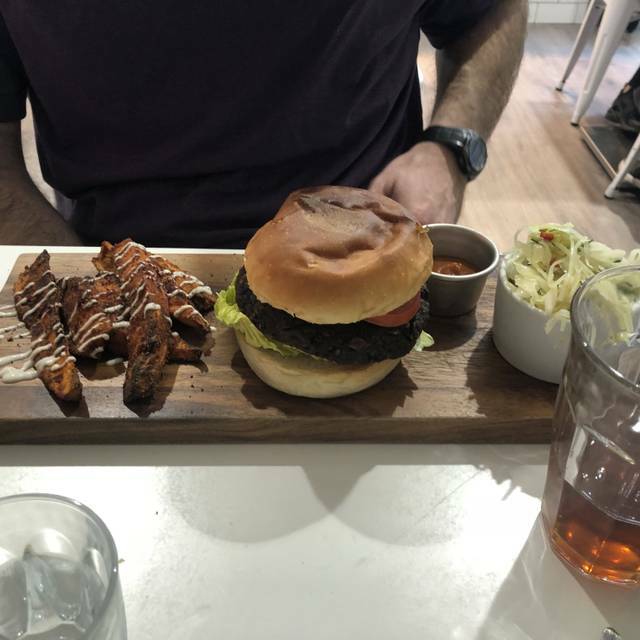 We visited Stem + Glory before going to a gig, not being local a friend recommended we try it out as she'd seen the menu online. We were blown away by how interesting, beautiful and utterly delicious all the food was. Such an interesting range of drinks as well, and so lovely to go somewhere completely vegan and feel totally at ease and be offered such great food options! Odd location but the restaurant itself was lovely and relaxed and the staff were so friendly! Will definitely be going back! 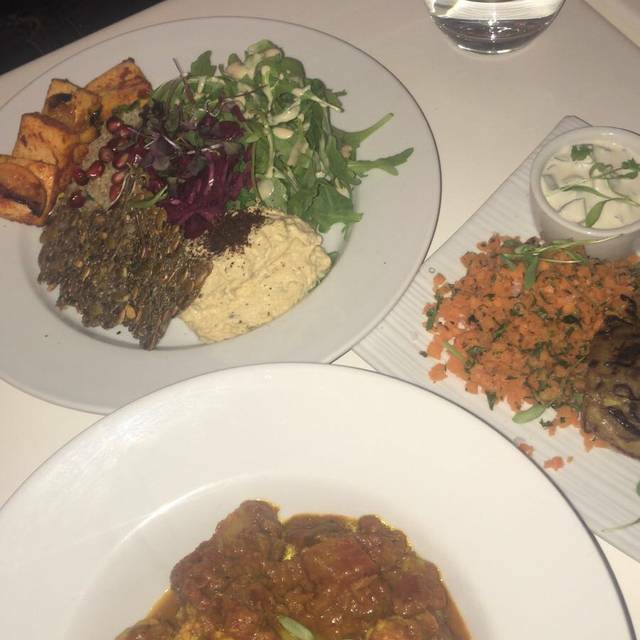 Excellent vegan food. Had a wonderful corn stew that exceeded expectations, tasty mango cheesecake and vegan Baileys. Would definitely go bak when I'm in the area again. Delicious and imaginative food. Great service. Nice atmosphere. Will return. 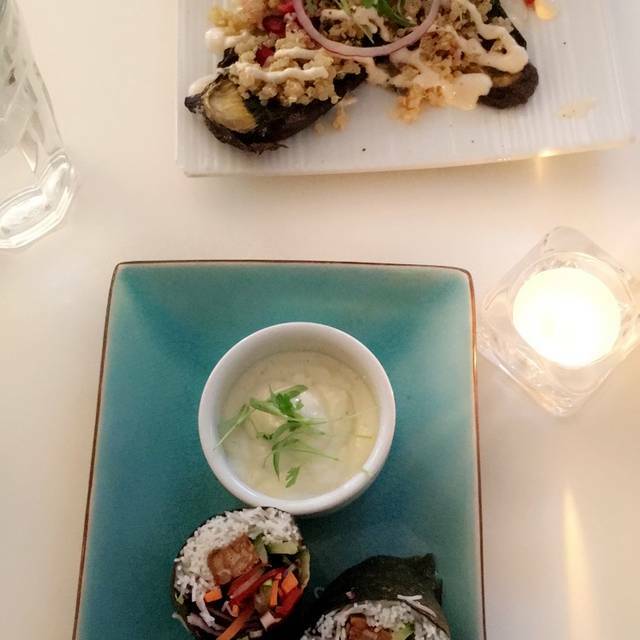 Great vegan food, including creative starters and great dessert options. Nice atmosphere. I had dinner with 2 omni friends and we all thoroughly enjoyed the food; the kimchi pancakes were a particular highlight. Service and ambience were excellent. We would've liked more choice of desserts - none of the options appealed to us, so we didn't order pudding, but I've had good desserts on previous visits. Amazing and healthy food. Really nice restaurant with friendly staff and good service. Perfect for a healthy meal for lunch and dinner.